When it comes to basketball and sporting apparel in general, Spalding is a name that can be trusted for sure. It has earned its reputation and a trust of the customers with the sheer quality of their products. We tested one of their premium basketballs and pitted it against the competition. The test has been conducted in several stages and we divided it into simple segments. The model in question was Spalding NBA Z i/O basketball in official size and weight (7). Since this is both an indoor and outdoor ball, we thoroughly tested it in both environments and it showed amazing results. Tight pebbling pattern provided excellent grip, although it struggled just a bit when the ball got dirty. The difference in surfaces can present a problem for manufacturers when deciding on a cover material. That stems from the fact that hard outdoor courts exert more wear and tear on the ball, but the indoor courts require more softness. 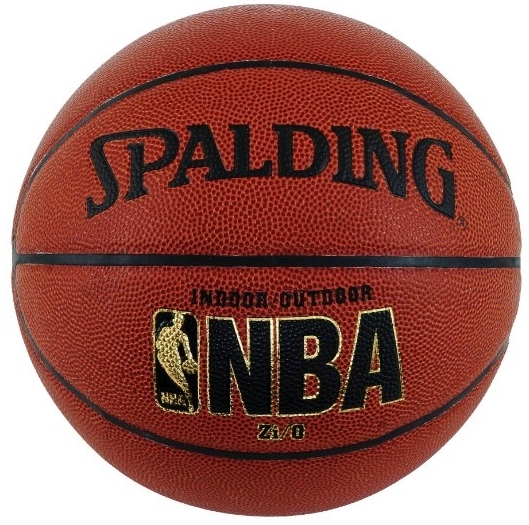 Spalding struck an amazing balance between durability and feel with the composite leather cover for the NBA Z i/O model. It manages to withstand the rough surfaces without showing any signs of damage while maintaining softness and a nice feel. This is the other major difference between the indoor and outdoor types of balls. Indoor balls need to have softer and a more consistent bounce. This model proved to be quite consistent in its bounce rate and you could always be sure that the ball is right where you expect it to be. The amazing part is the bounce passes on rough outdoor courts proved to be just as reliable. That is really an amazing feature and credits to Spalding for achieving it. The foam backed design makes sure that you can expect a bit softer bounce on the harder outdoor court rims. We always welcome a ball that bounces more into the rim as it increases our shot percentage. Experienced players know all too well how important balance is when it comes to a universal basketball. The channels on this ball are a bit narrow, but they are deeper which offers a better control during the release. The ball is really steady in flight and even on the windy outdoor courts, it remains in a steady rotation and flight path. Even though it has the official size and weight, it somehow feels a bit heavier which really contributes on short distance shots. This is a really good universal basketball and if you are playing on mixed surfaces, this is a smart buy. The pricing is competitive and considering the quality, this ball offers a good price\quality ratio.